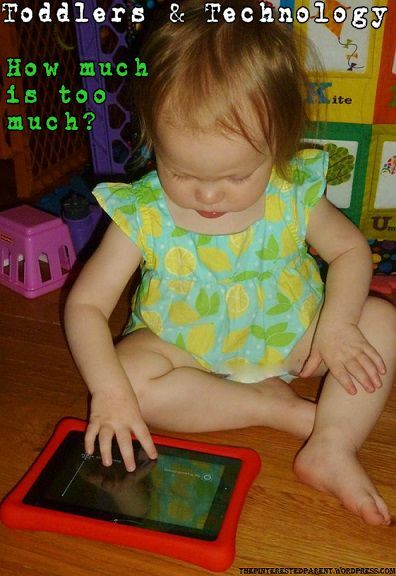 Toddlers & Technology – How Much is Too Much? Recently, a fellow blogger wrote in to one of the mom forums posing the question, “Should she get her child an IPad or a Tablet?” She was concerned because there is much debate on introducing technology to our young ones too soon. I have heard arguments for this coming from both sides & wanted to weigh in with my thoughts & maybe hear some of yours as well. There are a number of reasons that doctors and child psychologists list for not introducing television & computers at a young age. Most argue that none of these should be introduced before 2 and that even “educational programming & applications” may bear not any real learning merit. My daughter just turned 2. A common day with our daughter begins anywhere between 6:30am-8am and lasts until about 8-9 at night. During the course of my toddler’s day she eats, reads, colors, builds, pretends, cooks with mommy, chases the dog, jumps, crafts and yes, watches TV & plays on the computer. Shocking, I know! I first introduced her to the television with Baby Einstein videos. Her favorites were ‘My First Signs’ & ‘World Animals‘. Many may not agree with it, but it was a great learning tool for her. Mai was using sign language early on and many of her first words were animals that she had seen repeatedly from watching them on TV & seeing them in books. You may shake your head at me and say “Tsk tsk.” but sometimes, I have been even been known to throw in a video while I am trying to make supper. Technology is advancing every day. Computers are everywhere. To be successful in the world these days, you need a working knowledge of how they are run. Teaching our children at an early age how to use this technology gives them a great jump start to something they will need in their future. Do not let your child become a slave to technology. Make sure that they are active and that the majority of their days are still filled with several different activities. As I said before, my daughter’s days are packed with various things. She has taken swim classes, music , & is about to start tumbling too. She has a Nabi Tablet & she is registered with ABC Mouse’s Early Learning Academy. I love both of these and so does she. She does not use either of these without mommy, daddy or Nanna doing them with her. We still engage her during the lessons, by letting her point out the pictures & asking her questions. She is very proud to show us what she is learning. If my little girl is the little sponge that everyone says that she is, why can’t she absorb her learning from every resource that she can. I couldn’t agree with you more on this and my kids are definitely sponges and happy that they can absorb their learning any which way we can find and get it for them, too. Thanks Janine. My daughter learns from everything she sees. I think as long as we monitor the amount of time they are on the electronics, it is fine. There are far to many black & white rules given to parents from books & guides. I totally agree with you. As long as you find the right balance, technology can certainly be a beneficial learning tool. My son learned a lot from Baby Einstein and then The Little Einsteins. He loves the iPad and TV, and given the choice, he would do nothing but sit I front of a screen all day. But of course, it’s not up to him. My son also loves being outdoors, he loves to play, he loves to socialize. He loves books so much he has a whole library to himself AND was reading on his own at the age of 3. I don’t know if technology helped him do that but it certainly didn’t hurt! And as you said, technology is an essential part of our lives. And not only that but it is changing at a pace we can’t begin to understand. I think it’s important our little ones get some healthy exposure with adult supervision and contol. Thank you, Leila.He sound the same as my girl. She would also watch more if it was allowed but I shut it down to focus on craft time or puzzles, reading etc.. Like most things in life, I think with a little moderation & supervision, it is not as harmful as all the experts would have you believe. My daughter has picked up a lot from those Einsteins & ABC mouse. They have been wonderful for her. My little one has been on a strict “tech diet” for a very long time. Not only do I not want her consumed by it, but that’s a lot on her beautiful little eyes! Luckily, it has not been much of an issue in our home. I am so guilty of this! This is one of my vows to be less tech involved with the kids! A little tech won’t hurt, as long as we don’t overdue it. I use to love to expose my children to the latest technology and learning television programs. I think moderation and variety is the key. Thank you for your input. Moderation is definitely key & I agree with variety. I love to expose my daughter to as many different things as possible. I do believe technology can help with development but like you said don’t forget the social aspect of the child life. I think it’s key that you are engaging in these activities with her. I think technology gets a bad rap when it is use for hours on end to entertain kids and there is no adult participation. You are correct, technology is everywhere. The school my boys attend has technology class starting in kindergarten and they use I-Pads as well. I believe as long as there are limits and adult supervision, even young kids can benefit from some technology. You little girl is too cute in that picture! Thank you, Jessica. I know what you mean about parking them in front of the tech stuff for hours. I do know of some that use tv & computer games as a babysitter. This we don’t do. I have definitely put her in front of a video to cook dinner from time to time but the majority of the time she is in the kitchen playing with a bowl of raw chickpeas. Lol! Tech class in kindergarten. Wow! That is amazing. I know adults that haven’t even been through a computer course. Each parent must decide based on the intellect of their child. But I agree with you. Technology wasn’t a part of society when I was a young mother. My children are 35 and 26. I have grandchildren ranging in age from 5 to 21 though. Technology is an integral part of their lives. My 7 yr. old grandson has school homework using Microsoft Word! I do believe technology does need to be introduced at an early age but monitored in much the same was as any other activity must be monitored. Great post! I enjoyed the conversations! I think with all things, moderation is key. We should also not allow technology to become a “babysitter.” My daughter has had an iPad that we have worked on since she was two and she is leaps and bounds above the other children in her preschool class. We always work on her Tablet & the ABC mouse together & like you said about your daughter, my daughter is advanced for her age. I agree with your statement about not letting technology become a babysitter. Yes and No. My girls will be 4 in April and we still don’t let them play games on our computer. But, they do watch plenty of Leap Frog videos and Sesame Street videos too (among other movies). I really think there is no big rush to push them into these things. They will leave a lot by just living life too. They will definitely learn by living, no doubt. It is amazing how much they pick up.The things we do on the computer with our daughter are apps on the alphabet, numbers, animals, colors & other things. They aren’t really games. My son is only 3 months, but I already know that using technology with him while he’s young will be at a minimum. I don’t believe in the tv being a babysitter and the iPad being the only interaction a child gets. Even though my husband and I are young, we have some very traditional views when it comes to parenting. We strongly believe in playtime, especially outside and lots of play time with us and other kids (when he gets older).